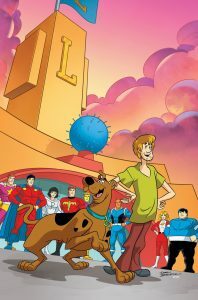 One of DC Comics’ current bright spots is “Scooby-Doo Team-Up.” Launching in 2014, the series features the Mystery, Inc. gang solving mysteries as usual, but with a special guest star. Said guest star is either another Hanna-Barbera character or someone from the DC Universe. It all makes for a fun series of crossovers. Plot: the Atom needs the gang’s help to solve a mystery involving a subatomic world’s populace under threat. An entertaining story. I liked how they acknowledged that the Atom’s Silver Age “travel long distances by riding the telephone wires” trick doesn’t work as well in the cell phone age. Plot: the gang (returning from the previous story’s adventure) meet Atom Ant, who’s fighting giant monsters. As others have noted about this series, the Hanna-Barbera stories are often zanier than most of the DCU-based stories. The unleashed monsters (along with Atom’s weakness) appeared in a few “Atom Ant” episodes. One episode had Atom fighting the (now-very-dated-looking) Tyrannosaurus rex that appears here. 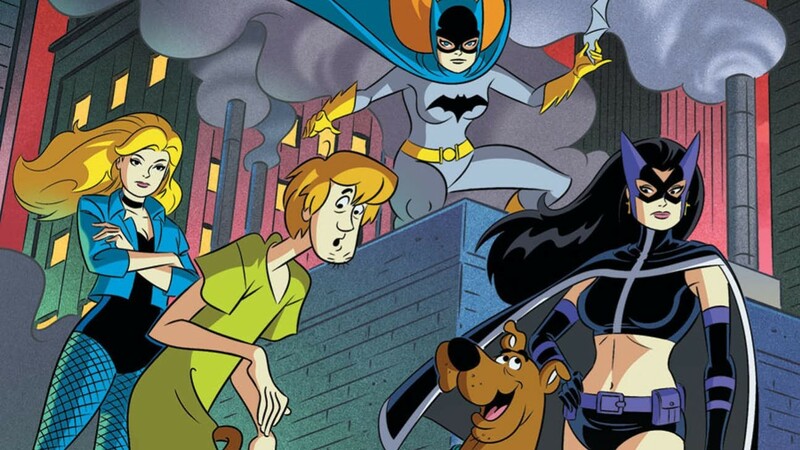 “Scooby-Doo Team-Up” #33. Art by Dario Brizuela. Plot: the gang are taken to the 31st century to help the Legion of Super-Heroes solve a case. The Legion hasn’t been seen much these days, at least since their title’s 2015 cancellation (in favor of a short-lived 31st century-set Justice League book). A fair number of Silver/Bronze Age Legion references appear here, though the costumes/Legion headquarters are based on their 60s incarnations. Darkseid’s running around in the 31st century? Interesting that there’s only two Legionnaires fighting him (and it’s Bouncing Boy and Shrinking Violet, of all members), versus being an “all hands on deck” every-available-member emergency. (“Great Darkness Saga,” anyone?) Speaking of members, there’s also no sign or mention of any Kryptonians (Superboy/man, Supergirl). Plot: the gang travel to Gotham City to help the Birds of Prey solve a case. I’m not a big Birds of Prey follower; the closest was my watching the short-lived CW TV show years ago. Still, I assume those that are fans might like this story. The BoP here include Batgirl, Black Canary, and the Huntress. As usual, the latter’s the post-Crisis comics’ Helena Bertinelli version, not the pre-Crisis Helena Wayne version. Plot: the gang try to have a relaxing picnic in Jellystone Park, but run afoul of Yogi Bear (and a ghost). The story’s a pretty typical Hanna-Barbera entry. In this story, Ranger Smith threatens to send Yogi to the Poughkeepsie Zoo. Poughkeepsie is a city in New York state, near Albany. In the “Yogi Bear” cartoons, Ranger Smith would usually threaten to send Yogi to zoos in St. Louis or San Diego. 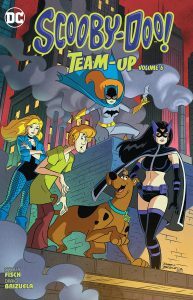 “Scooby-Doo Team-Up” #36. Art by Dario Brizuela. Plot: the gang, plus a large number of wacky heroes, investigate a telethon supposedly threatened by a monster. As some online have noted, one reason “Scooby-Doo Team-Up” exists is as a way to maintain the trademarks on various characters. There’s also the fact that historically, DC’s published a wide range of non-superhero comics, including humor titles. This story’s a big example of both, with the gang meeting a variety of DC’s now-obscure 60s humor characters here. Despite the number and obscurity of the characters, it manages to be a pretty amusing story. As they’re licensed characters, DC doesn’t own the rights to these comics; as such, they’ve largely not been reprinted since their heyday. Hence the stand-ins, “Rob Pope” and “Louie Jervis,” in this Scooby-Doo story. “Angel and the Ape” debuted in 1968, and had a short run. The characters returned in the 90s, with closer ties to the rest of the DC Universe. The stars are Angel O’Day, a human, and her partner, Sam Simeon, a talking gorilla. Both are detectives who solve crimes, though Sam also moonlights as a cartoonist. Various 60s DC Comics humor characters. 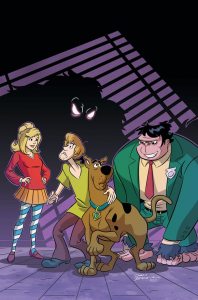 From “Scooby-Doo Team-Up” #36. Art by Dario Brizuela. Awkwardman: a super-strong but clumsy oaf. White Feather: an excellent archer, but only when nobody’s looking, as he’s very cowardly and nervous in public. As I figured, White Feather got along fine with Shaggy. The Blimp: has the ability to fly, but unfortunately only as fast as one can walk. Binky is seen at the telethon phone bank (he’s the guy in the white shirt). He was a long-running teen humor character DC Comics published (in the vein of Archie) from 1948 to 1960, and again in a late 60s/70s revival. The title of her book is based on “A Date With Judy,” a licensed DC comic based on a 1940s radio show of the same name. It ran from 1947 to 1960, with some of its plots/cover gags recycled for Debbi’s series. 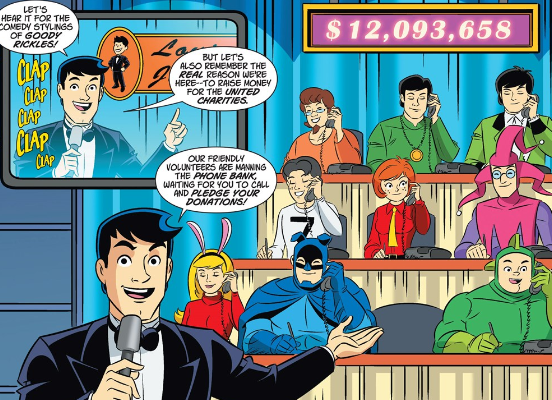 Windy and Willy (the two hippie-ish guys at the top left row of the phone bank) were characters created by DC altering the artwork to/changing the names of stories from their earlier licensed “Dobie Gillis” comic. Since then, they’ve gone largely unseen, outside of a cameo in “Showcase” #100 in the 70s. Scooter (the guy to the right of Windy and Willy in the phone bank) appeared in “Swing With Scooter,” a teen humor book published from 1966 to 1972. Designed to cash in on the popularity of the Beatles, Scooter was a British teen who’d moved to a suburban American town, after departing from his popular rock group. Stanley and his monster were a little boy and his pet “dog,” who’s actually a monster. The duo first appeared as backups in “The Fox and the Crow” #95 in 1966. “Stanley” ran for a few years, with the book renamed after the boy and his monster before it ended. The characters have appeared sporadically since, including a slightly darker take in a 90s miniseries that gave the monster a backstory. The Maniaks were a rock band that first appeared in 1967’s “Showcase” #68. Similar to the Monkees (in this story, they sing a take-off on “Last Train to Clarksville”), they’d have various misadventures along with their concerts. Finally, there’s Sugar and Spike. Created by Sheldon Mayer, the duo first appeared in “Sugar and Spike” #1 in 1956, and ran through 1971 in the US. (New stories continued to appear outside the US until the early 90s.) The feature is about the misadventures of a pair of babies, Sugar (a girl) and Spike (a boy). The two can speak to each other (and other infants) through “baby talk.” If it sounds familiar, it’s basically the same premise as Nickelodeon’s “Rugrats,” only decades earlier. The characters have been seen occasionally in DCU cameos over the years. In the mid-2010s, adult versions of Sugar and Spike gained their own miniseries; there, the duo work together as detectives, handling unusual cases for various superheroes. Next Post:Why is Superman more popular than Batman for live-action TV shows?